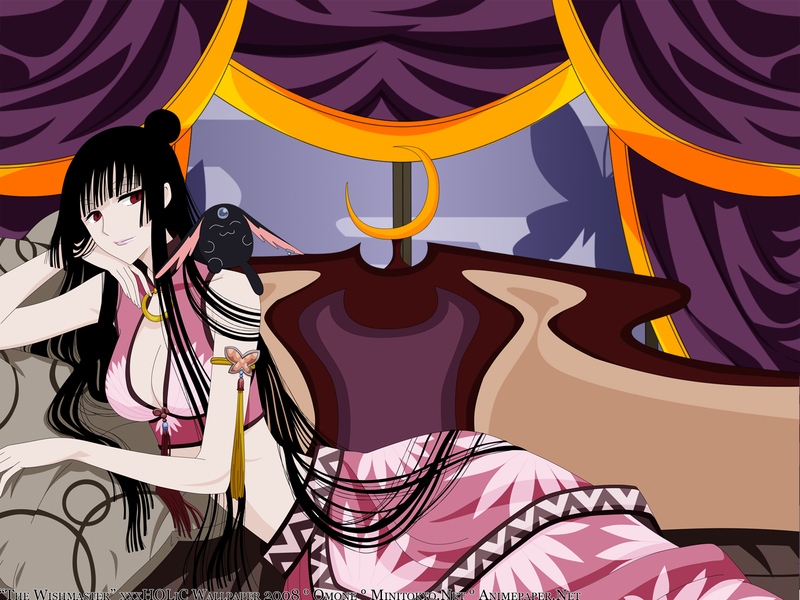 I finally did another xxxHOLiC Wallpaper after such a long time. Haven't made anything for 120 days! What a long time. Well, I have to admit that the Kei season killed all my love for xxxHOLiC and the recent chapters are kinda weird. Anyways I hope the series will come to an end soon. Okay let's see. I vectored this scan (you can find a PNG version of this vector here) Added the sofa from this sreenshot. The background with the butterflies is from this screenshot. I also added curtains. I used this scan as a reference. It was a lot of work all in all but kinda easy compared to other works I've made. Just a little joke. I think it looks great. I like the chara i only dislike her eyes, but this isn't your fault, her eyes are always looking like death. great work^^ nice and clean a fav from me for such a good work. your combination is just amazing! i would never have such a great idea! your vectoring is beautiful too! Wow, I like how you combined so many images to make this one wallpaper :o I love Yuuko's hair, and also the pattern on the outfit she's wearing ^^ Your vector looks great (just I see a small colour leakage of yellow on the right side of the middle curtain). And Mokona's too cute >.< Overall a wonderful addition to your xxxHolic series! I really love how this wallpaper looks so clean >.< And Yuuko looks as beautiful as ever! OMG! This wallpaper is totally great Omone-san! The vector is clean and neat. And i love the background! Looks is so cool and awesome! You made it very hard! Yuko is awesome :D I love this, everything looks so perfect and neat. Great work! I wonder why this isn't in the elite yet?It's really cool...I love how the lines are thick and the colors too...you did an awesome job on this! yeah Special A has unfortunately come to an end (but my next vector is for that series)..
As you saw... + fav! Pretty Yuuko~ thanks for sharing. ? wowie thanks you very much =)! This is very nice. Her ball of hair on her head is kinda comical though.